Sony's Tablet S is certainly a unique design among the sea of Android Tablets. While it gives it a very unique appearance, it also makes it quite a challenge to use at times particularly in the default landscape orientation. The display is one of the best when it comes to blacks, contrast and viewing angles but being prone to scratching as is the rest of the case mars it. Probably the most unique ability though is to be a PSOne and PSP compatible gaming platform. The net result is a Tablet that is certainly unique. Sony Tablet is designed to ergonomically fit your hand and shift its weight closer to your palm, making it feel lighter and more comfortable while reading and watching on the move. Its unique design also provides a more natural angle for typing and browsing while sitting down. Another important aspect of this Sony S 16 GB Wi-Fi Tablet is that this is first Playstation certified Tablet ever - meaning you get out-of-box gaming with PlayStation favourites Crash Bandicoot and Pinball Heroes plus the opportunity to download games from the original Playstation titles online. Besides the usual Tablet operations, Sony S 16 GB Wi-Fi Tablet comes with the additional applications, like Control your TV, Blu-Ray Disc player, Hi-Fi system, even your cable box from your Sony Tablet. The built -in infra-red Universal Remote is compatible with any brand, so you can flip channels or adjust the volume of your entire entertainment system from one screen. Rather than using a standard flat design, the Tablet S takes a wedge shape that invokes the image of a notebook or book with its flap folded back on itself. This gives it a slight angle making it easier to read when it is placed on a flat surface and also makes it easy to hold like a book in its upright form thanks to its contour. The same counter does make it a bit more uncomfortable to hold in the landscape form which is important because this is the standard orientation of Android Tablets and the front facing camera is centered at the top of the thick edge of the screen. The battery within the Sony Tablet S is a smaller one than in many other Tablets on the market. In video playback tests, this yielded roughly eight and quarter hours. 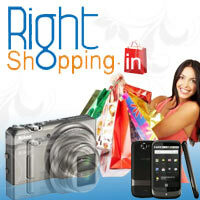 Just the visit onto RightShopping.in to get into your shopping deal, and you have the address at www.rightshopping.in/g/p_d.asp?pid=GD100011029&item=Sony S 16 GB WiFi Tablet to visit at.